Sinus Rhythm. This was read as normal by the emergency physician and by the computer. QTc is 400 ms. What do you think? See below. There are a few subtle signs of coronary occlusion here. Second, look at aVL. It has a massive T-wave compared to the size of the QRS. There is also a tiny amount of ST elevation but, again, it must be considered in the context of a very small amplitude QRS. There is minimal ST depression. 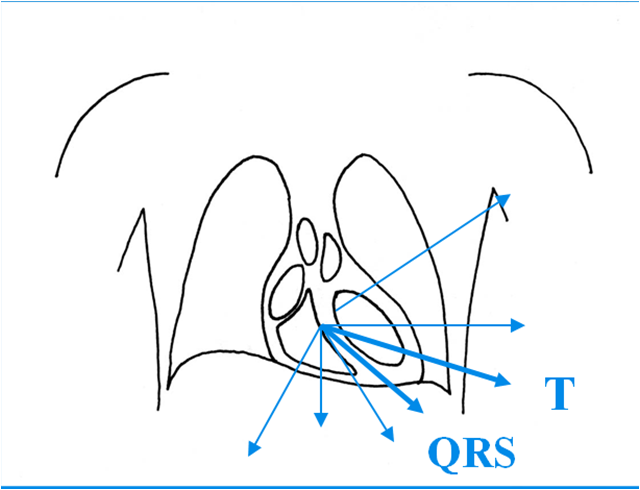 Although the T-wave appears also to be inverted, we know from the above graphic of T-wave axis, that there is not an abnormal T-QRS axis (they are nearly equal), which is what defines T-wave inversion. None of these findings are diagnostic of ischemia, but they should give you a high index of suspicion and prompt serial ECGs at a minimum. Formula: There is not enough ST elevation in V2-V4 to be applying the LAD/early repol formula, but if it is applied, one gets 1.5 mm of STE at 60 ms after the J-point in lead V3, 400 ms QTc, and 6 mm of R-wave amplitude in V4. The formula results in 23.43, just above the 23.4 cutoff! The patient was diagnosed with esophageal reflux and was being discharged by the nurse when he had a cardiac arrest. He was defibrillated. Now the diagnosis is obvious. Anterolateral STEMI. The rhythm is sinus with PVCs that occur after a P-wave but before it conducts. In V1, it appears to be alternating RBBB and normal conduction with high ST elevation. However, the 1st, 3rd, and 5th complexes in V1 are PVCs with RBBB morphology. The 2nd and 4th are sinus with normal conduction with deep QS-waves (not LBBB). Notice how visible the ST elevation is in the PVCs. He underwent PCI and had a good outcome. 2. Ischemia comes and goes. It may incidentally go away with antacids! Was there any wall motion abnormality on echo or CAD risk factors help us for early cath ? Initial biomarkers were negative. No echo done until after. 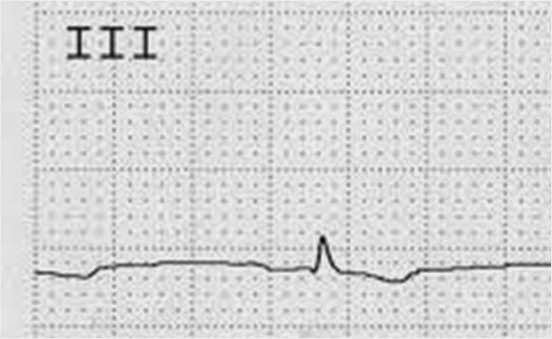 What is the rhythm on the last ECG? V1 is too strange, it looks like alternating LBBB/RBBB. Or is it SV bigeminy? 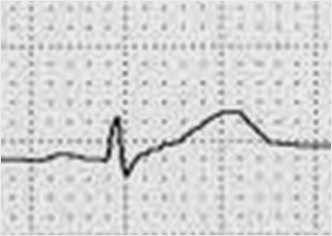 Look closely: The rhythm is sinus with PVCs that occur after a P-wave but before it conducts. In V1, it appears to be alternating RBBB and normal conduction with high ST elevation. However, the 1st, 3rd, and 5th complexes in V1 are PVCs with RBBB morphology. The 2nd and 4th are sinus with normal conduction with deep QS-waves (not LBBB). How can you tell that they are PVCs and not supraventricular conduction with aberrancy? Because the PR interval is short. The PVC happened before the P-wave could conduct. The morphology of the ST-T in aVL in the first tracing is very characteristic of early ischemic change, especially those times when aVL is even more perpendicular to the mean QRS axis. As the ST segment transforms from concave to convex it goes through a short interval where it appears to be almost a straight line from the J point to the peak of the T wave. Compare the ST segment in aVL with the ST segment in aVF just below it - the difference is striking. The thing that bothered me most is the st depression in aVR. But I feel crazy saying it. I'd also add to hints for the first EKG subtle ST elevation in I and V6. Dr Smith,is there a hint of downsloping ST depression in AVF also? Maybe.... I would't have called it.